Choosing the Proper Footwear– What's the Trick? Home fitness Choosing the Proper Footwear– What’s the Trick? Choosing the Proper Footwear– What’s the Trick? Shoes… They come in various colors, shapes, brands, materials, and quality. Whether they are a fashion statement, a functional device or a medical device; whether they’re intended for walking, running, working, partying… It is actually quite important to choose proper footwear. How many times have you bought a pair of shoes even though you knew that after walking just a few meters wearing them you’ll end up cursing them? You are not the only one. We all tend to buy footwear because of their lower price (typically accompanied by lower quality) or just because we like how they look. This is not a big deal if you wear uncomfortable shoes occasionally and during shorter periods. The actual problem starts when improper footwear becomes a part of your daily habit. It is estimated that approximately one in five people report some form of foot pain or discomfort. Footwear has a significant role in the development of foot and toe problems, such as bunions, calluses, corns and hammer, claw, and mallet toes. Not to mention the significance of wearing proper shoes in younger ages when the foot develops the most. In fact, flat feet, bad posture and later arch and heel pain can be a direct result of low quality footwear at a young age. How to Find the Right Footwear? If you appreciate other people’s opinion when it comes to shoe-shopping, it is best to ask the experts on the subject. Most shoe stores offer a free foot analysis performed by trained staff, or you can visit your podiatrist or sports medicine expert. This way you will find out more about your foot type and the specific needs of shoes which accompany your type. When purchasing training shoes rather choose more expensive than low-end gear. The best time of the day for shoe-shopping is the end of the day – this is the bigfoot faze because your feet are at their largest, due to the normal swelling. You have probably noticed that your feet are not same-sized. This is also normal, but be sure to fit your shoes according to how the larger foot feels in the shoe. In order to get an accurate sense of the lift during the fitting process, try to stand, never mind if looking a bit weird – walk around the store as long as it takes. Ignore the shoe size if it doesn’t feel right. Given the intensity of the action, running, uncomfortable and low quality running shoes can easily put you out of race for quite some time. 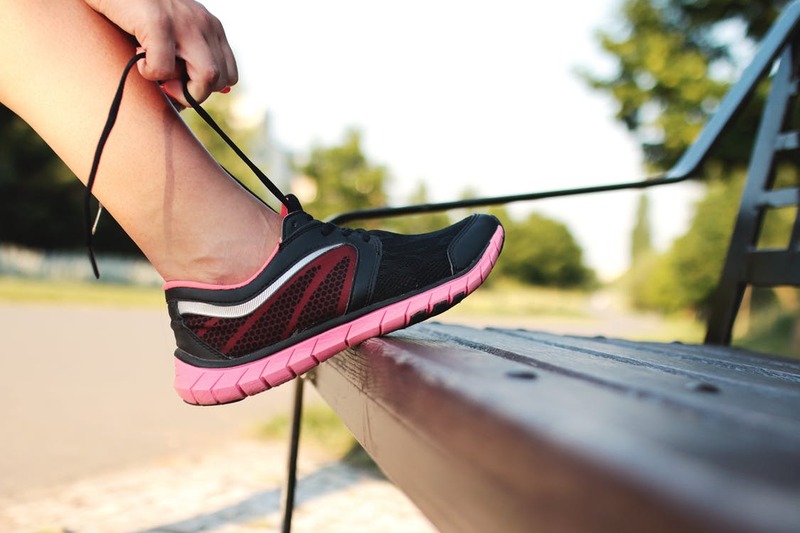 It can even cause shin splints or painful heels, so, it’s even more important to buy your running shoes wisely. Running shoes are more flexible than hiking shoes and they have extra cushioning to handle greater So, if you indulge in both activities, get a pair for each, and not just one multi functional pair. Get to know your feet. Besides the aforementioned expert’s help, you can also perform a “wet test.” Just wet your feet and stand on a piece of brown paper. If your footprint shows your entire foot with little or no curve on the inside, you’ve got low arches or flat feet, which roll inward. You need a shoe with a motion control feature and maximum support. It is quite the opposite if your footprint shows only a portion of your forefoot – in this case you need cushioned shoes with soft midsoles. For the lucky ones whose footprint has a distinct curve along the inside, “stability” pair is the right choice, with the right mix of cushioning and support. How significant is the influence of footwear on our musculature and bones describes a research on Arthritis, Foot Pain and Shoe Wear, which suggests that specialized footwear may even change muscle activation and reduce joint loading and rheumatic diseases. Keep that in mind the next time you treat your feet with some new gear. What is The Grapefruit Diet? How Does Calorie Counting Influence Your Weight Loss Regime?